Around the world, brave people who dare to take a stand for human rights are under attack. Marielle Franco was one of them. She fought fearlessly for black women, LGBTI people and young people in Rio de Janeiro. On 14 March 2018, she was shot to death in her car. The Brazilian authorities are keeping quiet about her death: but we will only get louder. Join us in demanding an answer: who killed Marielle Franco? Marielle Franco was a human rights defender born and raised in the favelas of Rio, Brazil. An elected councillor, she worked tirelessly to promote the rights of black women, LGBTI and young people. The day before she was murdered, Marielle Franco tweeted about a young man who had been killed: “How many others will have to die for this war to end?” Later, a car pulled up beside hers and Marielle was shot four times in the head. She died along with her driver, Anderson Gomes. Threats and attacks against human rights defenders in Brazil are pervasive. The response of the authorities has been inadequate and most of these crimes remain in impunity. We cannot let this happen again. If enough people speak out for Marielle, there is still hope that we can get the justice she deserves. Sign your name to demand an answer – together we must bring her killers to justice. Women human rights defenders face repeated stigmatization and violence within their communities and the contexts in which they work. Today, women human rights defenders embody the bravery, boldness and hope one needs to face such challenges. That’s why Amnesty International is partnering with Festival Iminente 2018 to celebrate the bravery of women human rights defenders around the world. As part of the global Brave campaign, Brave Walls is a collaboration between Amnesty International and the global  street art community to help increase awareness of human rights defenders. Adding his voice to Amnesty International’s ‘Brave’ campaign, Portuguese street artist VHILS will create a mural of Marielle Franco, a fearless woman human rights defender who was shot dead in Rio de Janeiro as she was returning home from a debate with a group of young black women. Her popularity was rooted in her life experience as a black bisexual woman and single mother who came from the favelas. 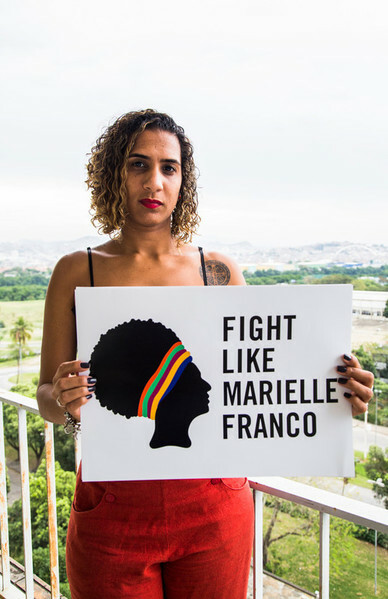 Marielle was elected as Rio councillor and stood out for denouncing human rights violations, especially against black youth, women and LGBTI people. Marielle continues to inspire people all over the world, and we won’t give up the fight for justice. Raise your voice and demand justice for Marielle! Through Brave Walls, we invite artists to help increase awareness of human rights defenders by creating stunning pieces around the world. With this artwork in Portugal, we want to make Marielle Franco’s case as visible as possible – not only to celebrate her inspirational life and continue fighting for the causes close to her heart, but to ensure that her killers are brought to justice. It is Art, peacefully and loudly, demanding for justice and Human Rights. Join your name to demand justice for Marielle Franco.